Heat oven to 325°F. In large bowl, beat 1/2 cup powdered sugar, the butter and vanilla with electric mixer on medium speed until light and fluffy. On low speed, beat in flour, almonds and salt until dough forms. Bake 13 to 17 minutes or until set but not brown. Immediately remove from cookie sheets to cooling racks. Cool slightly, about 10 minutes. Place 3/4 cup powdered sugar in small bowl. Roll cookies in powdered sugar. Cool completely, about 15 minutes. Roll in powdered sugar again. Cookies can be placed in an airtight container and freeze up to 3 weeks. Before serving, thaw the cookies and reroll them in powdered sugar. These rich butter cookies are also known as Russian Tea Cakes, Swedish Tea Cakes and Greek Wedding Cookies. 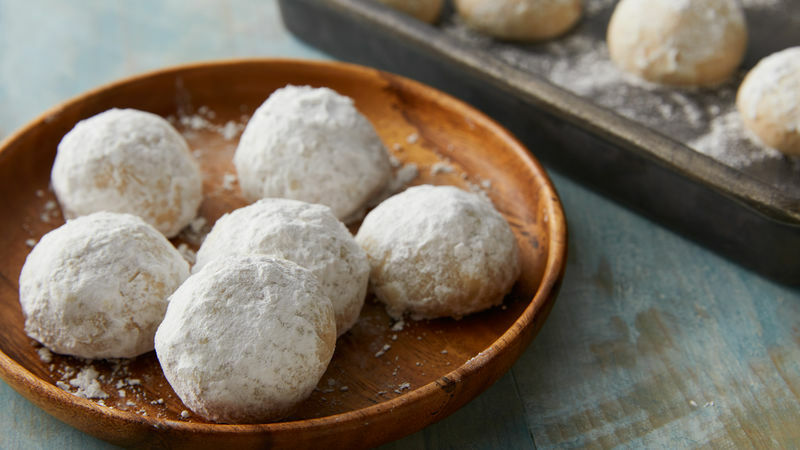 You may know this cookie by many names: Mexican wedding cakes, Russian tea cakes, snowball cookies and butterballs are all names associated with these delicious, round cookies covered in powdered sugar. The history of Mexican wedding cakes is largely unknown. Some believe the recipe originated in Eastern Europe. Whatever the origin story, these cookies became increasingly popular in the twentieth century, typically served during special occasions like weddings and Christmas. Key ingredients in Mexican wedding cakes are pretty basic. Most recipes like this one call for butter, powdered sugar, flour, salt, vanilla and some type of ground nut. You can use almonds, pecans or even macadamia nuts depending on your personal preferences. You can buy nuts pre-ground at the grocery store, but it’s easy to ground whole nuts on your own if you have a food processor handy! These cookies are easy to make ahead of time and store, too. Learn how by reading this https://www.pillsbury.com/everyday-eats/desserts/cookies-bars/how-to-make-cookies, where you’ll also learn how to store other types of cookies, too. Can’t wait to start baking this holiday season? Plan all of your cookie recipes for your party platter by printing out this Mexican wedding cookies recipe and browsing the rest of our easy cookie recipes.